The movie may be called Despicable Me, but the widely popular minion characters are anything but despicable. While they look like funny yellow tic-tacs wearing overalls, kids seem to get a huge kick out of the mischievous yet adorable minion gang. So if you’ve been on the hunt for easy craft ideas for kids, look no further than this collection of 13 Minion Craft Ideas for Kids. Minion crafts are great and fun easy crafts for a child's birthday party. Before the festivities start, do some paper crafts and have the kids make a pair of look-alike minion goggles. During the party, guests will have a blast playing games like bowling with minion pins or throwing minion darts. And of course, while you screen the Minions movie, kids can indulge in a classic dessert whose shape resembles...you guessed it: a minion! Just admit it. While the Despicable Me movies may be geared towards kids, you know that the minions “gru” on you, too. We guarantee that adults will have just as much fun making these easy craft ideas and party snacks as the kids. 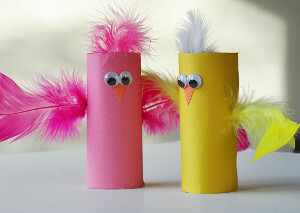 Pry your kids away from the TV and get them outside with these fun easy crafts. This collection includes fun minion crafts and games ideas that your kids can enjoy indoors or outdoors. Plus, there’s no way you could be labeled an evil villain for making these DIY craft projects because several of them double as recycled crafts. Looking for more crafts to make out of recycled materials? Then you'll have to check out this eBook, Cheap and Easy Crafts for Kids: 9 Recycled Crafts, for more awesome craft ideas for kids. Your kids may be obsessed with all things ‘minion’ but buying brand-name movie items seems like an evil plot schemed up by Gru. That’s why you’ll love these budget-friendly kids’ crafts. In this collection, you’ll find free printables and awesome paper craft ideas, so that everything from your Easter eggs to your stash of thank you cards resembles a cute, adorable minion! These minion-themed desserts are perfect to serve at a birthday party, sleepover gathering, or of course, a movie showing of Despicable Me! Kids will go bananas over these fun party snacks, and adults will love how easy they are to make. If you’re looking for edible crafts for kids, look no further than these tasty yellow treats. If you enjoyed making these minion crafts, then you'll also have a blast exploring this collection of Easy Crafts for Kids: 18 Dr. Seuss Inspired Crafts.